Over the years, She’s Got Crabs has developed relationships with restaurants and bars to bring in what is know as “dollar” crabs. Most restaurants/bars use this as a way to bring patrons in and substantially increasing alcohol sales during the week. There may not be a lot of money to make directly reselling the crabs to your patrons, but it keeps them drinking and you earning those dollar bills. You can select to have “dollar” crabs Monday-Friday to help increase your bottom line. Once you decide that you would like to increase your alcohol sales, give us a call at 443.956.2722. We will then set up an appointment to discuss how many bushels you would like to sell and what day(s) you would like to offer them at your facility. We can arrange a weekly time for your hot steamed crabs to be delivered. 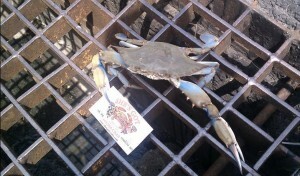 If you decide to take part in She’s Got Crabs “dollar” crabs, we will provide paper and mallets free of charge. Not sure? We can accommodate you and start off small. Still not sure? You can order as minimal as possible so there is NO risk. At She’s Got Crabs, we never have and never will pre-steam crabs so your clients are always getting the freshest product possible. Everyone in Maryland eats crabs, why not let them eat them at your facility? Please give me a call if you want to start making extra profits during the summer months with this Maryland tradition!